Art Autonomy Network [AAN] acknowledges artistic practices by individuals and groups who act in areas outside large cultural institutions and commercial spaces. We execute various programs, such as exhibitions, workshops, symposiums, educational programs, and create art archives. We also construct systems and develop contents that are necessary for promoting art in an international context. By intimately interacting with spontaneous art projects and groups that expand nationally and internationally, we aim to become a smoothly connected network, internationally and compositely. We have added Art Autonomy in our name, to signify the independence of art when we have set up AAN in 2005. AAN has focused on national and international, spontaneous and alternative art practices. Unfortunately, we feel that in the present condition, many of the documents and information that have been gathered during various art activities have been scattered and lost. Over the years, we have gathered and kept documents (flyers, posters, catalogs, etc.) of national and international art activities, and artists’portfolios according to our own methods. AAN utilizes its network to archive documents of individuals and groups who practice in the field of art, to create a composite archive. This programme is also good for audience to understand art works through their direct voices. In today’s society, there are many institu- tions and groups who successfully practice art using alternative methods, and with alternative members. AAN sees these associations’and individuals’ information as cultural resources and construct a network with high mobility. By matching institutions and individuals, and creating interactive situations, we support their practices to expand dynamically. By knowing the world’s current art scene and by having a wide vision, we believe that the artistic activities will continue to evolve. At AAN, we actively develop international projects to offer opportunities for artists and curators to foster more prolific inspirations and better methods of examinations. We manage projects for Japanese artists to go abroad and for overseas artists to come to Japan. Also, as supporting projects for these, we coordinate dispatching undertakings and events aimed to promote international ex- change. At AAN, we offer various educational programs for people who are interested in art and are enthusiastic to “learn”. By presenting art and cultural history, and theory, which often seem difficult, in such a way that make them easy to understand, we hope to extend art’s horizon. Today, human resources development in the field of art is accelerating. We offer opportunities to learn English and art along side each other, so people will become more internationally minded, and to train talents that will, in the future, take active role in international activities. When Kato stayed in the UK in the 90’s, she witnessed the YBa flourishing (Young British Artists) and saw the innovative forms of pioneering art organizations in London. The artists who took initiatives in creating spaces to show their works were striking individually. They were not restricted to conventional museums and commercial galleries that were the mainstream spaces for exhibitions. Instead, they turned spaces such as vacant stores and churches around the town into galleries of their own and were creatively showing their works. She strongly felt that the pride and creativity seen in these artists’ attitude were needed in the Japanese art scene as well. After returning to Japan, Kato managed “RICE+” which used to be a rice store in Mukojima, Sumida-ku that was renovated into an art space and artists in residency. From this experience, she began to see that although similar kinds of art groups and spaces existed nationwide, they lacked information and distribution of information. She realized that this situation was problematic and thus, decided to establish AAN to create an archive and network dealing with the national and international alternative art activities. Since its establishment in 2005, it has collected information and portfolios form various art scenes, and it has also held events to promote interaction. She says that the most memorable project was the 2010 reenactment of “Jazz Café Chigusa”. It used to be a café that was very much loved by the locals and stood for decades in Noge district, Yokohama. Seeing people who knew Chigusa shed tears not only did it reconfirm the importance of “documentation”, but it has also made her realize a new path that archive should follow. It may be difficult for mainstream galleries and museums to create a space to experience the atmosphere of the past and a space for conversations to take place, but it may be possible for alternative art spaces. AAN will continue to cooperate with the nation’s NPO and cultural institutions to challenge the conventional way of archive. up and continues to inspire Japan’s alternative art scene. 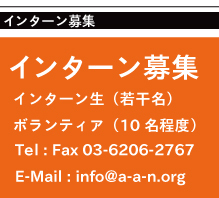 ■ AAN’s Activity Archive of 2011-2013. “Creative Hub 131” is an experimental space and shared office. It is a renovated building that used to be a wholesaler for beddings. Its members are creative people such as artists, designers, editors and consultants, who are active in various genres. During July 16~18th, 2011 (3 days), using the occupant’s strengths, various exhibitions, lectures and parties were held to celebrate its opening. AAN presented “Working Complex Clinic”, an event to discuss what “work” is, with artist, Ichirou Kitamura and invited Toshiki Enomoto as a lecturer of “the experience about Reversible Destiny Lofts MITAKA” (July 20th) which is designed by Shusaku Arakawa, an artist. Since 2007, we have continuously held meetings where artists and curators give presentations that talk about their work publically. On February 19th 2012, Kenichi Kondo, the curator of Mori Art Museum and Reichi Noguchi, the curator of Mitsubishi Ichigokan Museum were invited as commentators for the meeting. On Mach 10th 2013, Motoaki Hori, the chief curator of Tokyo Opera City Gallery and Shingo Yamano, the head of secretariat at Koganecho Area Management Center, were also invited. It aims to become an opportunity for artists to meet new people and to widen their range of activities. Also, we hope that the conversation between the artists and the curators seen at these meetings will spark the audience’s interest in contemporary art. On March 8th 2014, the students of “Art and Communication Laboratory [advanced session]” gave their presentations in English. The commentators for this event were Hitoshi Kuriyama (artists and assistant at Tokyo University of the Arts) and Peter Bellars (artist), who tutored the class. Workshops of OrNamenTTokYo, which aimed to explore the alternative urban life in Tokyo, were held on November 6th, 11th and 12th, 2011 (three days). The workshops were organized according to the three topics, “remix/ walking in the city” (November 6th) “in-tangibilities/ to materialize sympathy, locality and structure” (November 11th), “housing/ thorough debate” (November 12th). 12 each gave presentations and “Project FUKUSHIMA!” (Directed by Hikaru Fujii) was screened at this gathering. 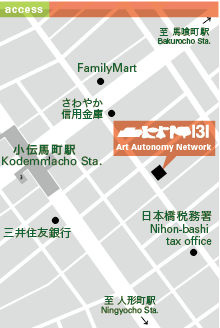 “ART SYNCHRONICITY” was held through March 2nd ~ 11th, 2012 with the cooperation of stores and galleries around Nihonbashi area. After experiencing the huge pain caused by the Great East Japan Earthquake, we realized the importance of the forming a sympathetic local community. With this as a pivotal point, AAN began to promote more art activities in the local communities. 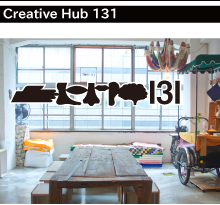 As “Creative Hub 131” as the central base, we are holding art events with the local people and community to challenge ourselves in creating a network connecting the world using art. This event was organized in such a way that the audience became familiar with the streets, as they went around the city to see the exhibitions in different locations. Exhibiting artists were Aki Ikeda, EAT&ART TARO、Kouo Uehara, Keijiro Niino, Ichiro Higashiizumi, Shiho Fukuhara, Georg Tremmel [BCL], Hiroyuki Hukuoka, Toru Matsushita, Isamu Mutou, Satoshi Murakami, Takashi Yamauchi, Wataru Yamakami, Takuya Yamashita, Etc. “Food Correspondence” is a project planned by EAT&ART TARO, an artist who creates works relating to food. This project required people, who live far apart and do not know each other, to send each other meals four times through delivery, like exchanging letters (March 7th, April 11th, May 9th, June 13th). The correspondent was an architect who lives in Nakatsugawa, Gifu. At the one day, Bettara Zuke (daikon pickled in salted rice yeast) and Hanpen (minced and steamed fish cake), which are food related to Nihonbashi and Edo, were sent through freezer delivery, then wild boar meat and deer meat arrived in return. Through this correspondence of food, understanding of each other’s local culture and natural features deepened. This eventually evolved in to the tour to Nakatsugawa (July 15th) from Tokyo and again, intimate interaction through food took place. This project aimed to liven up Ebisuko’s festival, “ Bettara Ichi”, which has continued for over 400 years in Ōdenmacho, Nihonbashi. It presented an opportunity to learn more about the local history and culture, looking at it from a new point of view. Its tag line was, “Edo study, beginning with a daikon”. The central concept of this project was to learn the “ancient world in a new way”, adding a touch of new interpretation to the history, starting from a familiar festival of Nihonbashi, and looking at the diet and life of the old days. 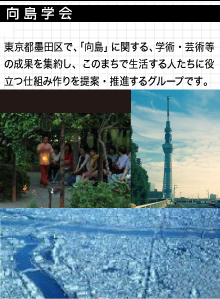 In total, five sessions including, “Bettara Ichi’s Town, Former Good Denmacho’s Tradition” (July 7th), “Excursion Part 1: Daikon Tour to Tsukiji Fruit and Vegetable Market” (July 21st), “Edo, Tokyo’s Vegetables Sent Out From Nihonbashi” (August 4th), “Bookstores Around Nihonbashi” (September 1st), and “Creations on the Rooftop” (September 15th) took place. During “Bettara Ichi” (October 19th and 20th), we organized a tour to go to historical and cultural sites around Ōdenmacho as well as Bettara Ichi, as a special session of this project. Also, as an additional session, we organized “Excursion Part 2: Anecdote of Chushingura, Kira’s Head” (December 15th). This excursion took the participants from the remaining of Kira’s mansion to Senkakuji, following the path of Akou Roshi (47 Ronin). the public, and introduced our artist’s portfolio collection. Also, artists, Iori Yoshimoto and Hideaki Idetsuki showed and sold their original works. This project was a part of “Thank you@RT Day” (March 9th) established to show artists’ appreciation to the art fans, and we also held “39 (Sankyu/ Thank 13 you) Art Day Party” (March 10th). Canada based artist, Daisuke Takeya and Onagawa-cho, Miyagi based art teacher, Chie Kajiwara to establish a supportive project regarding the Great East Japan Earthquake, and AAN is a cooperating group for this project. Before the excess secondhand Japanese elementary school backpacks donated as relief supplies to the area stuck by this disaster. Total of 70 artists and artist groups from Canada and Japan turned them into art works. These works go on “field trips” to stores, houses and vacant places all around the nation, to connect people and local areas. AAN has sympathized with this project and has recommended 11 Japanese artists to participate, as well as coordinated the venues for its travels in Kamiyama-cho, Tokushima and Nagoya, Aichi. After the exhibition at Embassy of Canada Prince Takamado Gallery (January 15th ~ 29th), these works were due to travel to Canada. OuUnPo is European artistic group that is like a travelling laboratory. It is an organization without a fixed location, who share knowledge and co-create works through workshops and symposiums that deals with art all over the world. Their sessions have focused on different themes, according to the venues. In Japan, they have held sessions in Tokyo and Yokohama with “Gozilla and Pheonix” as the theme (June 17th ~27th, 2013). Everyday, at the venue, participating organizations and people shared mysterious experiences, which seemed to intertwine with each other. For this project, AAN has organized farming village experiencing event (June 26th) in Katori, Chiba and symposium that included walking around artists’ studios in Mukojima. Protection against disaster and community were the topics (June 27th: Kameido Studio) for these events. This was an art event that opened exclusively from November 16~ 24th, 2013 at Nagoya TV Tower. At the kickoff meeting, Kato, the director of AAN gave the keynote speech (September 6th, 2013). She was the curator of artist, Motohiro Tomii’s solo exhibition, “Fabric Town” (September 7th~ 14th) at N-MARK B1 Gallery which was a pre-launch event for this project. Both, Chojyamachi, Nagoya and Nihonbashi, Tokyo are wholesale districts for fabric. The artist created 3-dimentional works, using the fabric of ready-made clothes collected in these two areas. The title of the exhibition, “Fabric Town”, has an underlying message that hopes for the exhibition and the works to connect the two places. “Cloud Museum” used the unused second and third floors of the TV tower that was transformed mainly by local artists. It became a temporary museum, where they were able to show their works. During this project, we also presented “TV Tower Exploration! Workshop” (November 17th) by Rumi Kawamura. At this workshop, participants carried art backpacks, on their back and walked around the TV tower and the city. Today, the town of Kamiyama in Tokushima is being noticed for its population growth due to various activities including art and IT. AAN has worked closely with this town’s activities. For example, Kato works as a member of the assessment committee for “Kamiyama Artist in Residence (KAIR)” and we have coordinated events for “Field Trip Project” here. In 2013, four Canadian artists stayed in a while and organised the children’s workshop called “Kamiyama Good!” and promote the activities by students who led foreign guests as visiting internship. Along with KAIR’s exhibition reporting its activities and the symposium of “Field Trip Project” taking place, AAN planned an art tour to introduce Kamiyama’s appeals. in English” (November 2013~ March 8th, 2014). International exhibitions, overseas dispatching programs and artist in residence programs have broadened the artists’ and curators’ opportunities to become internationally active. Today, it can be said that English is an essential skill for the people working in the creative industry. Therefore, AAN has decided to hold an English training program centralized in art. At the introductory sessions (November 19th, 26th, December 3rd, 10th and 17th, 2013, 5 sessions in total), the students learned to discuss about culture and art. At the advanced sessions, (January 18th, 25th, February 1st, 8th, 16th and 22nd, 2014, 6 sessions in total), the students created artist’s portfolio aimed at overseas audience, and acquire skills to be able to respond well at interviews in English. Also, at the “Portfolio Meeting Vol. 10”, the students gave their presentations in English.